Fleetwood RVs for Sale at Motor Home Specialist, the #1 Volume Selling Motor Home Dealer in the World and now a full line and fully authorized Fleetwood RV Dealer. Fleetwood RV origins date back to 1950. It was founded by John C. Crean in Southern California. As of 2016 Fleetwood RV produces Fleetwood Diesel motor homes including the Fleetwood Discovery RV, Fleetwood Excursion RV, Fleetwood Expedition RV and relatively new to the market is the Pace Arrow class A gas spinoff diesel pusher RV, the Fleetwood Pace Arrow LXE. Fleetwood RV also produces the highline luxury diesel RVs American Coach. Fleetwood RV also produces a large number of class A gas Fleetwood RVs and class C Fleetwood RVs. 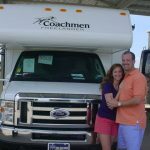 As of 2016 the class A models include the Fleetwood Southwind RV, Fleetwood Bounder RV, Fleetwood Bounder Classic, Fleetwood Terra RV, Fleetwood Terra SE, Fleetwood Storm and the incredible affordable Fleetwood Flair crossover RVs. The Class C models include the Fleetwood Jamboree Sport, Tioga Ranger, Jamboree Searcher and the Fleetwood Tioga Montara. Over the years Motor Home Specialist has offered Used Fleetwood RVs for sale, but could not be more proud to announce our new partnership with this iconic motorhome manufacturer. Fleetwood RV is now a part of the REV Group with build much of the country's fire and safety vehicles among other things. Their recreational vehicle line-up includes not only Fleetwood RV, but also Monaco RV, Holiday Rambler and of course the American Coach line. Fleetood is a broad spectrum motor home builder meaning they build diesel pusher RVs as well as Class A Gas motorhomes and Class C RVs. Before offering the Fleetwood new RVs, some of the most popular used RVs sold at Motor Home Specialist have always included Fleetwood. These coaches have truly stood the test of time and that's why there are so many Fleetwood Motorhomes on the road today! The Fleetwood Discovery, for instance, dates back to 1996 and used Fleetwood Bounder RVs date all the way back to 1986! Motor Home Specialist is proud to have sold countless used RVs by Fleetwood through the years and again, are so excited about our new partnership. For additional information about Fleetwood, the models they produce and Motor Home Specialist, please feel free to call one of our sales representatives today. You will not only find a great selection, but the everyday and upfront low sale prices that has made us the #1 volume selling motor home dealer in the world. Save 25% off the M.S.R.P. every day on all new diesel class a, class A gas and class C motor homes at MHSRV.com - Call us. You'll be glad you did! *Updated 8/11/16 - All weights, measurements, sizes, dimensions, features, options, etc. generated from manufacturer's website at time of update and not specific to any particular year model. This information is deemed reliable, but NOT guaranteed by the manufacturer or Motor Home Specialist due to continual product revisions and occasional OEM changes in the product, as well as any potential for human error when generating or posting these features, specifications or any other details. Please feel free to contact a Motor Home Specialist representative or the RV manufacturer for up to the minute product details before purchase. Thank you for shopping with us at MHSRV.com - We all look forward to hearing from you soon. 800-335-6054.